Isn’t June the best month of the year? We get nice warm weather, summer begins, pool days, grilling outside, baseball in the summer sun, Tommy John surgeries, and… wait a minute, what was that? Who in their right mind associates Tommy John with fun outdoor activities? Sad Yankee fans who have had back to back years of players in the system go under the knife in June, that’s who! Last year saw Gleyber Torres get TJ on his non throwing arm and now its Jordan Montgomery‘s turn to accept the almost inevitable surgery for pitchers. Comparisons can’t really be made between Torres and Monty’s injuries and the effects TJ will have on their careers but in both cases its just a damn shame to lose the guys for a year+. With every season ending injury comes the wave of disbelief and sadness for the player but then the inevitable “what the heck do we do now” moment. The Yankees have felt the need to add starting pitching depth all season, especially when Monty went down with his original elbow injury a little over a month ago but now that there is no hope for a return in 2018 things just got hotter in the oven. Last year near the trade deadline the Yankees dealt with a similar problem when they were figuring out what to do after Michael Pineda went down with a season ending injury. As we all now know they ended up making a move on deadline day to add Sonny Gray to the rotation. Flash forward to June 5th, 2018 and Sonny Gray has been the worst Yankee starter this season, carrying a 5.50 ERA and 4.71 xFIP into his next start on June 6th against the Blue Jays (which was a stellar 8 IP, 2 H, 2 BB, 8 K outing). Domingo German has filled in as best he can for Montgomery in his starts since the injury and most likely will continue in that role for a bit further. While German has not necessarily been consistently bad he hasn’t been consistently good either. One has to wonder if he is best suited for a bullpen role with his pitch arsenal, velocity, and finishing breaking pitches. The big question is where do the Yankees look for help, outward or inward? Well, its probably a combination of both. While there hasn’t been any concrete rumors this far out from the deadline the big names of Hamels or even Bumgarner have floated around NY Media in regards to who Cashman should be targeting. But that might not happen until mid to late July. In the meantime the Yankees will probably be required to look inward for their next starter. That is, if they decide to switch things up from German. In my preseason top 50 list there were 5 pitchers in the top 10 and 9 in the top 15, so you’d have to imagine one of those guys could foot the bill. Below is a table of 5 of those 9 pitchers, 4 of which are top 10 and 1 within the top 15. The list has 6 sets of stats with no names for a reason. Remember I said 5 of the names came in the top 15 but what about the 6th set of stats? Here’s the top down list of names corresponding to where they appear in the above table. Wait a second, surely I’ve got the order wrong here, who the heck is Erik Swanson?! Swanson came over to the Yankees in the 2016 deadline deal that saw Beltran sent to the Rangers for former first round pick Dillon Tate and 2 other players. Swanson carries a larger frame at 6’3″ 235 pounds and has a smooth over the top arm movement to the plate. However, due to his inability to move up the ranks with his age he never quite made headlines even with his strikeout abilities. In fact, at the time of the Beltran deal, according to Fangraphs WAR projections, Swanson had a 75% chance of never even making the MLB roster. Since then however things have changed quite a bit. Swanson started the 2018 season in AA and carried a 0.44 ERA and 0.81 WHIP through 40.2 IP. Those are video game numbers right there. Following his incredible start, Erik received a promotion to AAA and while his pure dominance has not been the same his peripherals still look good. His ERA ballooned up to 5.06 through 2 starts and 16 IP but his xFIP is sitting at a much nicer 3.62. Obviously a far cry away from 0.44 but if anyone thought that would be a long term trend they are crazy. “My curveball … it was virtually nonexistent last year,” Swanson said. “It was very inconsistent. It didn’t have that sharp break like it had the year before. I spent a lot of time working on it. I went through a few different grips last year and struggled with a few of them. It appears Swanson has found his groove with his pitch arsenal and is taking advantage of that. But there are also things that point to maybe this being just an anomaly thats due for regression. For example, in AA when he had his ridiculous start he posted a 91.2 LOB% and a career low BABIP of .250. In fact, while his LOB% decreased in AAA his BABIP is still under his career average at .304. So has Swanson just been getting lucky in 2018? Well, we aren’t quite sure yet but what he has done is put himself on the map to potentially join one of the best teams in baseball. It’s not out of the question either that one of the other names from the list isn’t a better fit. Of the 5 other names listed I’d say Chance Adams and Justus Sheffield in that order have the highest chance of seeing the bigs this season. Adams has struggled mightily compared to his 2017 performance but in his last start he went 5.2 IP with 7Ks and no runs. Sheffield on the other hand dealt with an injury earlier this season and has since come off the DL and is working back into form. I see a higher possibility of seeing Sheffield coming up for September roster expansion and a more regular dose of him come the 2019 season. 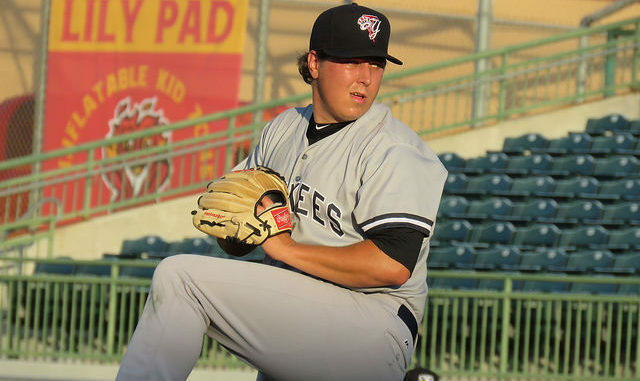 With the recent option of Tommy Kahnle to AAA the Yankees are in need of some bullpen help and depth. Especially as Adam Warren finds his groove after returning from his own DL stint. My answer to this problem is move German to the bullpen and call up Swanson for a few starts. He is certainly not too young for this roster and could potentially be a solid addition addition to the Yankee rotation and at worst a mistake that can be moved on from. Let’s hear what you guys have to say though? Agree or disagree with me? Who’s your next Yankee prospect call up?